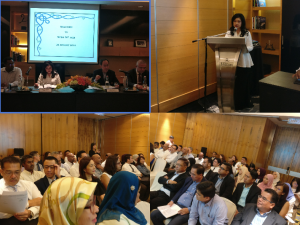 In her welcoming speech, the President of MCBA Nora Manaf thanked the out-going Executive Committee members for their contributions and services for the past two years and was glad that all of the six committee members offered themselves for re-election. She also thanked all member banks and unions for their efforts which contributed to peaceful industrial relations during the period under review. She went on further to highlight the challenges of the present and future which would require close attention and monitoring, These challenges relate to the changing economic landscape; the imminent policy changes, in particular, those related to industrial relations, to be made by the new government; the advent of the digital economy and how to mitigate its risk on job security and lastly, the challenging tasks to conclude the current on-going collective agreement negotiations with three unions. Member banks unanimously re-elected the following banks to the Executive Committee – Maybank (Chairman), RHB Bank (Secretary), CIMB Bank (Treasurer), Affin Bank, Hong Leong Bank and Standard Chartered Bank. Over forty representatives of member banks attended the function. Among them were Heads of Human Resources, Nor Rozita Nordin (Affin), Samuel Tan (Bank of America), Florence Foo (StanChart) and Kok Lai Ching (OCBC). Most of the Industrial Relations Heads of banks were also present. Copyright © 2011 Malayan Commercial Banks' Association.